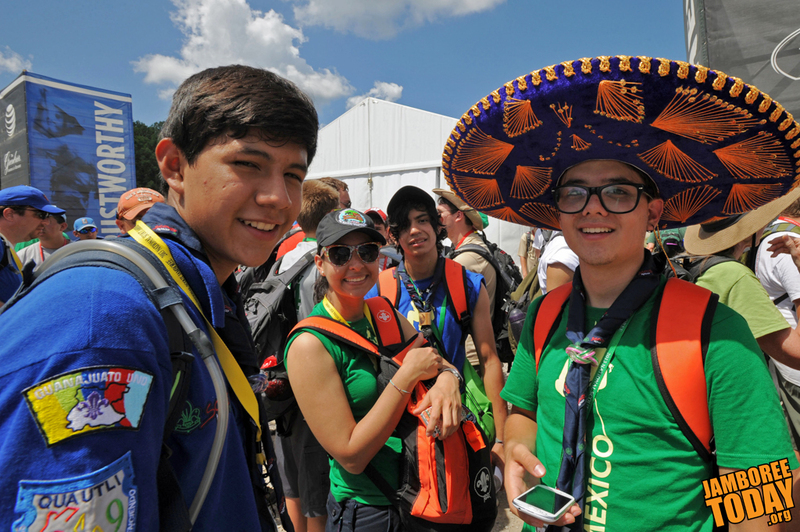 Scouts from Mexico mix with their American hosts at the Scott Summit Center during the 2013 National Jamboree. BSA photo by Jeff Hattrick. In addition to the Scouts and Venturers from all corners of the United States, the 2013 National Scout Jamboree hosts Scouts from across the world. International participants and staff contribute to and enjoy amazing programs at the Summit Bechtel Reserve. Most international Scouting programs are coeducational with only rare exception. Jamboree participants from outside the U.S. are therefore housed in Base Camp F with the Boy Scouts of America's Venturers, which also includes young men and women. Before arriving at the Summit some foreign contingents included side trips to U.S. tourist attractions. Scouts from Saint Petersburg, Russia, for example, traveled to Gettysburg National Military Park in Pennsylvania to experience a bit of U.S. history. In conversation with international participants and American Scouts and Venturers, the chat often explores differences and similarities about culture, history, and food. The weather is a frequent topic. "The humidity has been the hardest," says Australian Scout Allistar Smith. Most northern hemisphere campers bask in summer warmth during July, but the Australians are in the middle of winter along with everyone south of the equator. Smith's hometown of Melbourne is still warm even in winter, but it's a "dry" heat, Smith says. Other differences discovered include variation in the world Scouting movement. However one says the Promise, international participants add to the Scouting fellowship at the jamboree. Jag lovar att efter bästa förmåga följa scoutlagen. Daniel M. Reck contributed to this report.